The woodlands under the control of Brighton Borough Council are extensive for an urban area, with some 504 hectares of mixed specie, mostly broadleaved woodland existing on farmland, open spaces, cemeteries and Parks. While not all were administered and funded by the then Parks Department but other departments, the Council decided that the restoration of all damaged areas would be lead by the Arboricultural Department working in tandem with the Council’s Managing Agents, Strutt and Parker. The first task was to agree which of the damaged areas would be cleared prior to replanting and which would be left to regenerate naturally. Further discussions took place over the type of replanting, species selection, size of planting material and long term maintenance to ensure establishment. Such discussions invariably returned to costs which were obviously going to be high (if not astronomical) as specialist assistance would be needed to undertake clearance of hundreds of fallen trees in difficult terrain prior to any planting to restore the woodlands. The decisions were also delayed by the constant involvement of some local environmental groups who hoped to achieve support for their own particular agenda with constant criticism of the Council’s plans for action. It was interesting to note that none of these groups had any more experience than us in dealing with such an extreme situation but were adamant that each was right and the Council wrong. One body even fed the the Evening Argus misinformation which sadly they were happy to promote rather than support a Council that was committed to restore its sorely damaged green environment. It was most gratifying to note that following the successful clearance of hundreds of fallen trees and the establishment of all newly planted areas, not one of the critics ever condemned the restoration programme again the general public though applauded loudly. However, I digress. Much of the success of the restoration planning was down to Strutt and Parkers Edwin Macadam unstintingly led on the process of acquiring financial grants to supplement the substantial commitment of the Borough Council and worked tirelessly to help us finalise the planting and maintenance schemes to be undertaken following clearance. 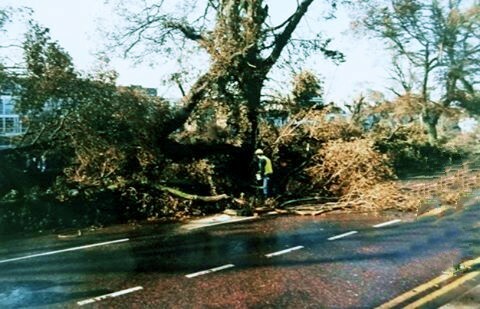 Edwin’s skill and commitment in organising such matters allowed the Council’s Arboriculturists to return to the day to day tasks that still plagued the area following the Storm. 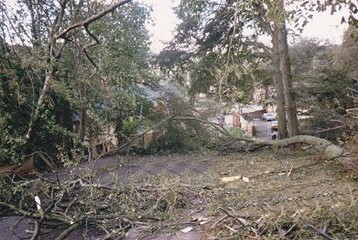 Once the full Council had agreed our final proposals and finances were in place, we tendered for the works and ultimately engaged Mark Maitland whose Forestry Company had already gained a good reputation for clearance of other large storm damaged sites. Again we were lucky to have a further great professional on board and Mark and his Company never gave any cause for concern. While the majority of timber in the woodland could only be sold for low grade pulp wood Mark still managed to eke out some income allowing the massive undertaking to be carried out within the original estimates. Following the clearance many hectares were subsequently successfully planted with a range of mixed species representing those original species lost to the hurricane force winds although the opportunity was taken to supplement the species with additions considered to be beneficial to some areas of new planting. The majority were planted as whips having some two seasons growth and were placed in biodegradable tree tubes. These were meant to break down in sunlight over a few years giving the young tree initial protection before breaking up. 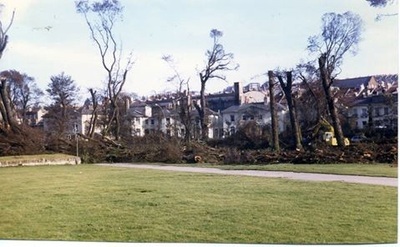 The reality was that this didn’t happen, perhaps due to the shade afforded by the density of surrounding vegetation, but most needed to be removed manually over an extended period and the odd one can still be found intact and stretched to capacity low around a healthy tree bole after all these years. Due to the huge scale of planting, manual weed control was not possible either financially or in resource terms and a programme of tree base chemical weed control using Glyphosate based products was religiously adhered to until the young trees’ individual canopies closed out the sunlight preventing the growth of competing ground cover. The current condition of the substantial areas of woodland that were cleared and replanted following the most damaging event to the areas green environment, is such, that for those walking the woodlands things appear to be ‘as they should’. Similarly, other areas where clearance was following by some replanting while allowing natural regeneration to supplement the restoration have also done well. The areas left to only natural regeneration at the insistence of some ‘green experts’ have had mixed areas of success at least in terms of Woodland Management as these often have many poor quality trees generally together with an unhealthy percentage of fast growing unwanted colonisers, especially Sycamore.